When we bought our dream home eight years ago, we assumed we didn’t need a pest inspection. Cold climate, concrete slab, steel frame, brick veneer – no problem, right? Any pest inspector could have told us that termites are as likely to be found in our kind of house as they are in your average weatherboard bungalow. House age, rather than construction type, is the key factor in termite presence; and the highly destructive species, Coptotermes acinaciformis, whose subterranean nest can consist of more than one million tiny chomping machines, is common throughout the New England region. According to the CSIRO, termites affect one in five homes in Australia and cause more damage than fires, floods and storms combined – around $200 million each year. The pest inspector we didn’t consult before buying our property might have warned us that the previous owner-builder had effectively constructed termite heaven: by nestling garden beds full of woody shrubs right up against the walls of the house and scattering untreated landscaping timbers liberally across the five acres, including a wooden retaining wall metres from the back door. In fact, they had so much fodder outside that it’s no wonder it took them a while to venture indoors. I was moving furniture, hunting for a lost library book when I discovered termites busily engaged in a recycling enterprise involving my bedside cabinet and the cork tiles upon which it stood. Initially, I was alert but not alarmed. Even if we did have termites, our home buildings insurance would pick up the tab for any repairs that were needed, right? When I rang to make sure that I could unstress, unhassle and unworry about the problem, I was informed that, like most home insurance policies, ours specifically excludes damage caused by insects. We took the bedside cabinet outside and chopped it up for firewood. That was a mistake, because the termites burrowing through the floor took fright and decamped. 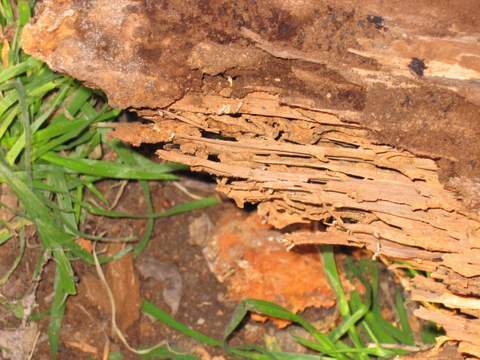 Evan Wright from Pestbusters calls termites ‘nature’s perfect creation for recycling’ and he believes home owners need to know more about them. “The worst thing people can do when they find termites is to panic. Just cover them up, leave them alone, and call a professional to deal with the problem,” he advises. Evan has known people to respond by deploying fly spray, but as he points out, you have to destroy the nest, which may be up to 80m away from where the termites are working. For environmental and health reasons, it is no longer legal to treat termites with organochlorines. Baiting systems are a popular option nowadays – they work by enticing the termites to feed on wood doctored with a substance that destroys the colony when it is carried back to the nest. There are three termite baiting systems registered for use in Australia: Nemesis, Exterra and Sentricon. A trap for new players (which of course we fell into) is that although these systems work in a similar fashion, they do vary quite markedly in price. Individual pest control companies usually don’t offer all three types, so you may end up paying for multiple inspections in order to get a full range of quotes to choose from. Based on our experience, a pest inspection costs around $180 and a 12-month program of termite eradication can set you back from $1800 to $2800. You may also decide that you need ongoing monitoring, which we found can range from $600 to $1200 a year, depending on the baiting system and the pest control company chosen. The CSIRO fact sheet on termites, which can be found at http://www.csiro.au/resources/Termites.html, notes that they are most active from early spring to late summer, and advises home owners to have a program of regular inspections arranged with a pest controller – twice a year in warmer climates, once a year in colder climates.